North America was the largest geographic region accounting for $23.95 billion or 49.72% of the global market. The USA was the largest country accounting for $23.21 billion or 48.18% of the global amusement parks market. Amusement parks are increasingly using virtual and augmented reality technology to provide an immersive experience to customers. Virtual reality is a 3D, computer generated environment which can interact with a person, whereas augmented reality turns an environment into a digital interface by placing virtual objects in the real world. Amusement parks are implementing this technology in rides and theater-based attractions. For instance, the Weave Breaker coaster brings the reality of jet skiing in an amusement park. North America was the largest geographic region in the market, worth nearly $24 billion. The USA was the largest country accounting for almost half of the global amusement parks market share. According to The Business Research Company’s Consultant, Oliver Guirdham, amusement parks are now creating walk-through versions of popular movies and TV shows to offer unique experience to customers. Amusement and theme parks are offering games, rides and shows based on popular movie franchises, TV shows, and video games. This service being offered by theme park operators enables visitors to closely experience their favorite characters. Major theme parks with blockbuster worlds include, Wizarding World of Harry Potter at Universal’s Island of Adventure, Star Wars Lands at Disneyland Florida, Toy Story Land at Walt Disney Studios Park in France, and Shrek and Madagascar Lands at Universal Studios Singapore. Walt Disney Parks and Resorts was the biggest player in the global amusement parks industry, with revenues exceeding $18.4 billion in 2016. Walt Disney Parks and Resort’s growth strategy aims to attract more visitors by launching new attractions and entertainment in its theme parks. The company is in the process of adding a Star Wars attraction at its parks in Orlando and Anaheim, California. Walt Disney Parks and Resorts is also adding an Iron Man attraction and constructing a new hotel in its park in Hong Kong. Amusement parks are commercially operated enterprises involved in providing facilities for recreation, amusement and clubs, or leagues, involved in playing games for recreational purposes. These companies operate mechanical rides, water rides, games, and picnic grounds. These are equipped with recreational devices such as Ferris wheels, roller coasters, carousals, swings, bumper cars, trains, monorails, sky rides and other forms of entertainment. The amusement parks market is segmented into Theme Parks market; Water Parks market; Arcades And Parlors; Others. 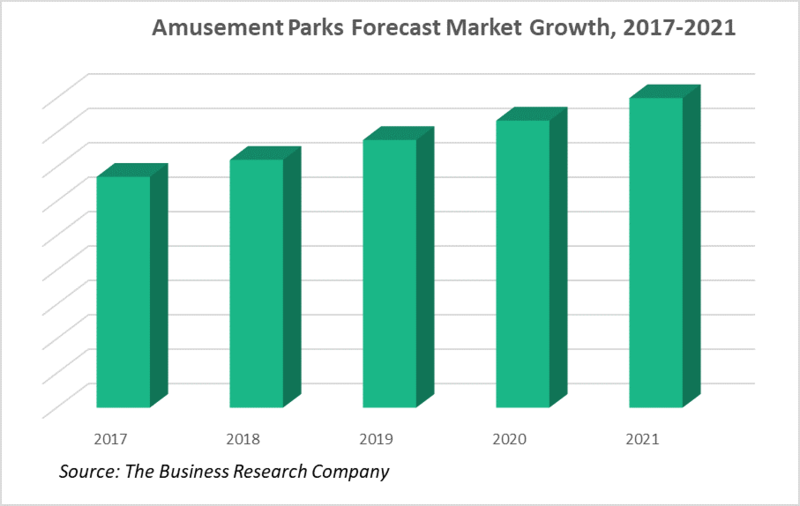 Amusement Parks Global Market Report 2018 is a detailed report giving a unique insight into this market. The report is priced at $4000 for an individual user. To use across your office, the price is $6000 and $8000 if you wish to use across a multinational company.